There is nothing that smells better than banana bread when it’s baking! 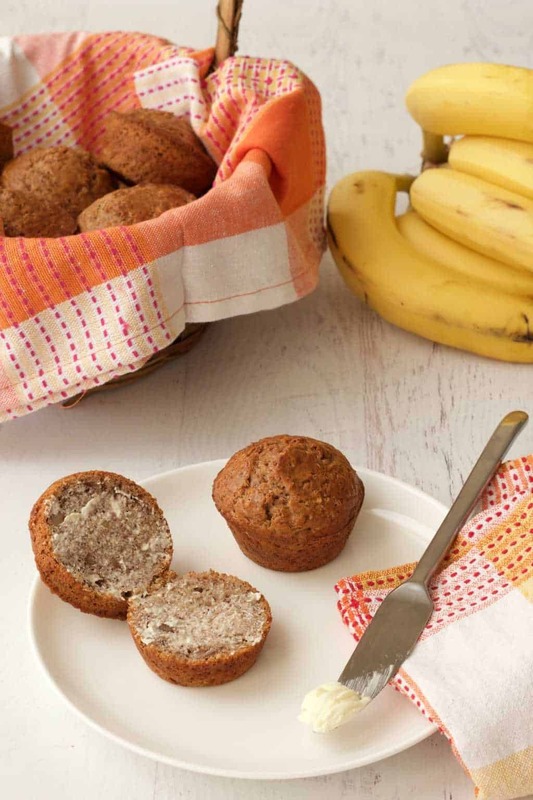 Even if these vegan banana bread muffins were not delicious (but oh wow they are! ), just the smell of them baking would be reason enough to make them. 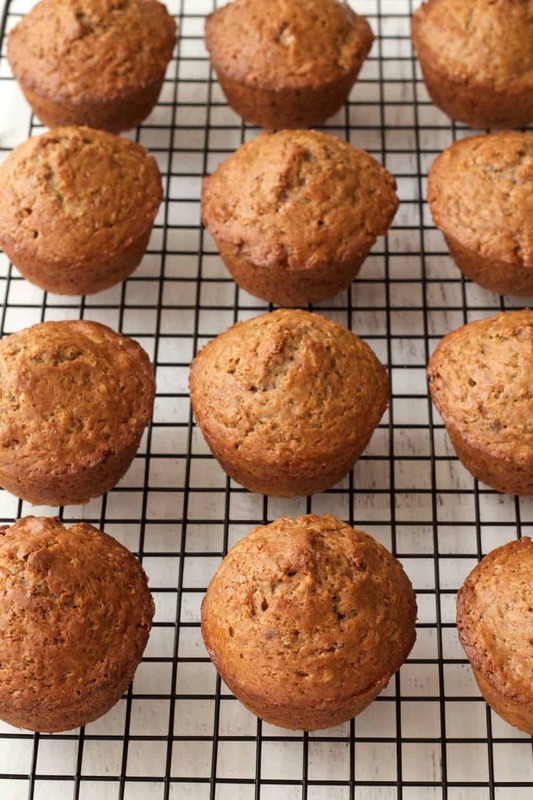 Your house smells like a dream for a few hours after baking these babies. And there is nothing better than slathering on some vegan butter and eating them warm from the oven. 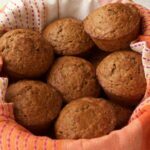 We’re big fans of vegan banana bread around these parts, so I knew that vegan banana bread muffins would also be a surefire hit. I made two batches of these babies when I was testing my recipe, and with 24 banana bread muffins at our place one might’ve thought they might last a few days, but oh no. They were gone in about 24 hours! Jaye was eating them 3 at a time. Bless that man’s metabolism! I love them spread with vegan butter but Jaye eats them as is. I tried making a batch using muffin liners, but I wasn’t a fan. The reason being that when they’re still warm from the oven (which is the best time to tuck in in my view), they’re hard to get out of the liners, half of them gets left behind inside the muffin liner. It’s only once they’re cooled completely that this stops being an issue. So leaving the muffin liners out of the equation completely solved this problem. I just sprayed the muffin tray with a non-stick spray first and it worked perfectly. The best smelling thing you can bake! 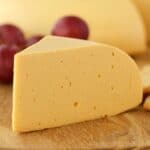 They are at their absolute best when fresh, but if you’re going to consume them within a couple of days then just keep them covered at room temperature and they will be just as delicious. If you want to keep them longer than a couple of days, then put them into the fridge (covered). However, they do harden in the fridge. So the best thing is to heat them for 20-30 seconds in the microwave before eating them if they’ve been kept in the fridge, and this restores them to the perfect softness. 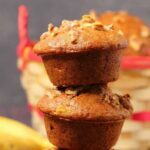 Any questions or comments about these gorgeous vegan banana bread muffins post them down below! 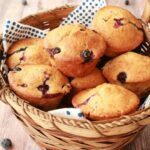 And if you make these muffins, pop back and rate the recipe and let us know how they turned out! For more delicious vegan muffins, check out our vegan bran muffins, our vegan blueberry muffins and our vegan chocolate chip muffins! And if you’re not already subscribed, then get on our email list! 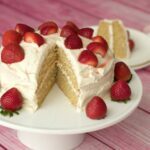 Not only do you get an awesome free ebook with 10 gorgeous recipes, but you’ll stay updated with all our latest recipes. 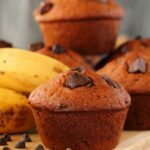 Moist and delicious vegan banana bread muffins. Delicious served either warm from the oven or cold, with lashings of vegan butter or just plain! 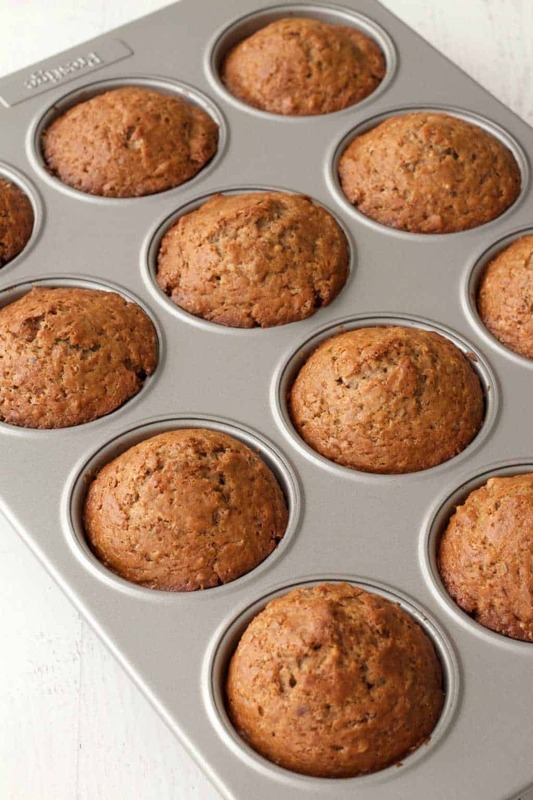 Have the best smelling house on the block when you make these muffins! Sift the flour into a mixing bowl and add the sugar, baking powder, salt and cinnamon. Prepare the flax egg by mixing 1 Tbsp flaxseed meal with 3 Tbsp Hot water and allowing to sit for a minute. Peel the bananas and add to a blender along with the soy milk (or other non-dairy milk) and the coconut oil. Blend. Pour the blended mix over the dry ingredients and mix in. 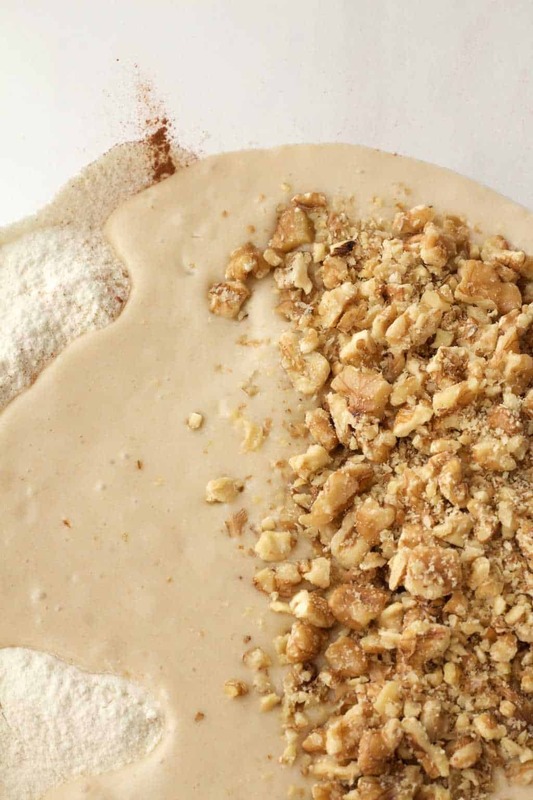 Crush the walnuts by placing into a ziplock bag and rolling over it with a rolling pin to break the walnuts into small pieces. You don’t want them completely crushed, just broken into small pieces. 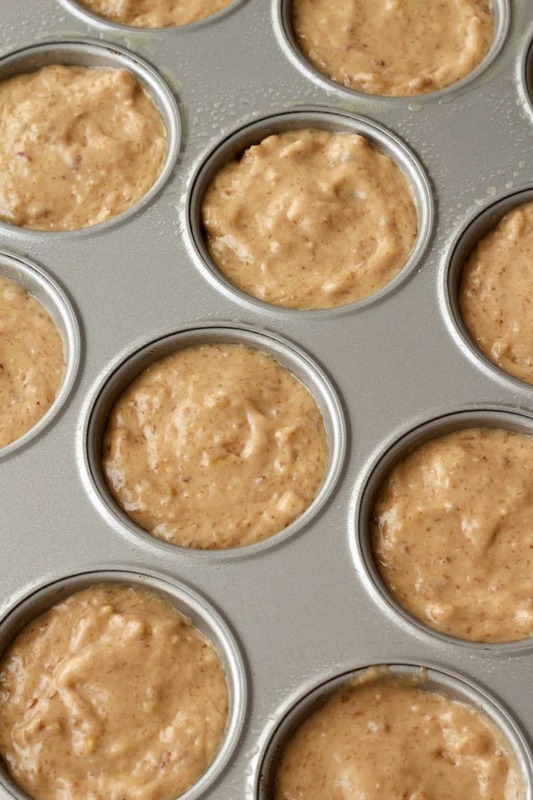 Spray a muffin tray with non-stick spray and then divide the batter evenly across the muffin tray. Place into the oven and bake for 30-40 minutes or until a toothpick inserted into the center of one of the muffins comes out clean. Transfer to a wire cooling rack to cool and serve warm with or without vegan butter. *For the best most accurate results weigh your flour and your bananas. *Adapted from our Vegan Banana Bread. Hahaha, I know what you mean! They’re just tooo good! Thanks for posting! Just made these again today. only had half cup of walnuts so tossed in half cup of vegan chocolate chips. 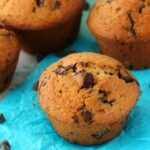 My husband, a non-vegan, actually requested these muffins after he scoffed a bunch the first time I made them. These are great and versatile!! Cool! Chocolate chips is a great idea! Hi! I am doing a cooking challenge at my school where we must use four required ingredients: bell peppers, lemons, flax seed, and rice. 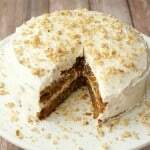 I wish to make a vegan dessert, and I love this recipe idea! Although being that I have to include these items, I need advice, and I already have an idea for the lemons. Can you give me advice for incorporating the other three ingredients into this recipe? I am assuming removing bananas would be the first step. Can rice be put in batter at all? Or will that ruin the layout? Hey Ashlee! I don’t think this would be a good recipe to use with those ingredients. I think with those choices I would be leaning more towards a savory recipe, like maybe a fried rice with lemon in the sauce. 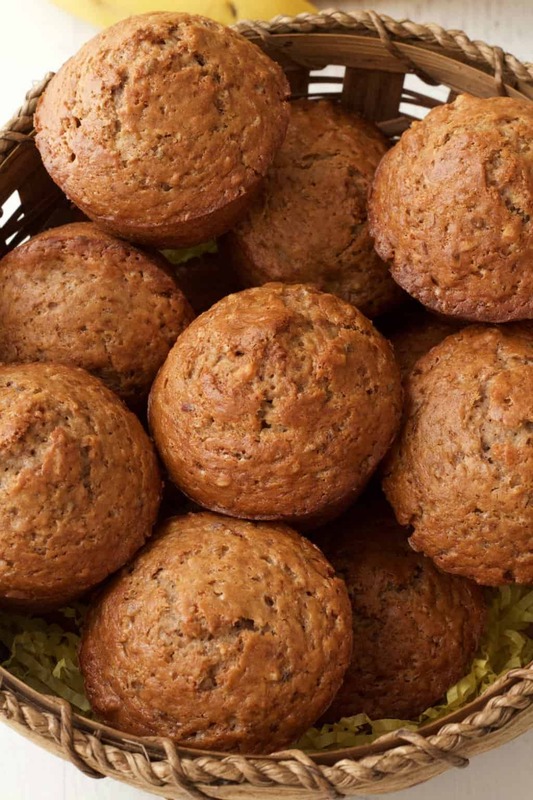 Or if you want muffins then maybe some savory muffins. Sorry I don’t have any other advice! Best of luck with it! 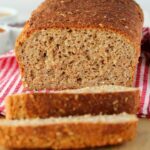 What can i substitute for the flaxseed meal? I’m new to veganisim and only have flaxseeds but not flaxseed meal..
You can grind them up yourself into flaxseed meal if you have a grinder. Otherwise you could use a 1/4 cup of applesauce as a substitute or a bit more banana (around 1/4 cup mashed would be a substitution). These turned out really good! I added a cap full of vanilla flavor to the banana mixture. And used pecans instead of walnuts. Never used a blender for the banana mix bfr, that was genius. Will be making again! Awesome!! 😎 Thanks for sharing! 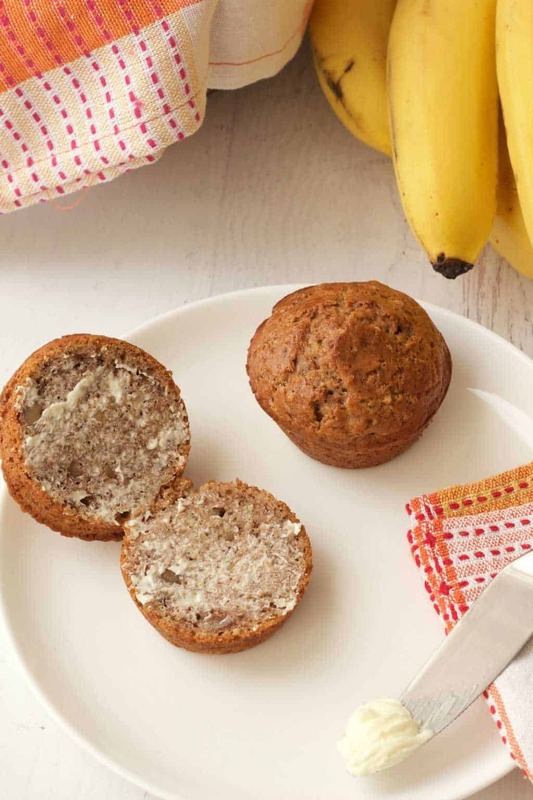 Have you tested this recipe at all with Oat flour? Or is there any reason you think the results would be less than optimal? I made these today and although I had all the ingredients I exchanged one of them and another for the half. I used RAW Organic Coconut Sugar instead of the Brown Sugar and replaced HALF of the All Purpose Flour with Oat Flour. I think next time I’m going to use the full 250 grams of Oat Flour. By the way, I’m using a Hot air oven at 170 degrees celsius. Good to know that oat flour worked well! Thanks for sharing! I was able to post a picture on Pinterest! I’ve made this twice and it’s amazing! I used regular oil instead of olive oil and left out the walnuts just because I didn’t have any. I’ve found it only needs like thirty two minutes. Can’t wait to try your other recipes! This recipe sounds great. The only thing is I don’t use oil so do you think it would still turn out ok if I omit the coconut oil? You could try substituting a little applesauce or extra banana for the oil? I don’t have flax eggs. Is there something else I can substitute it with? 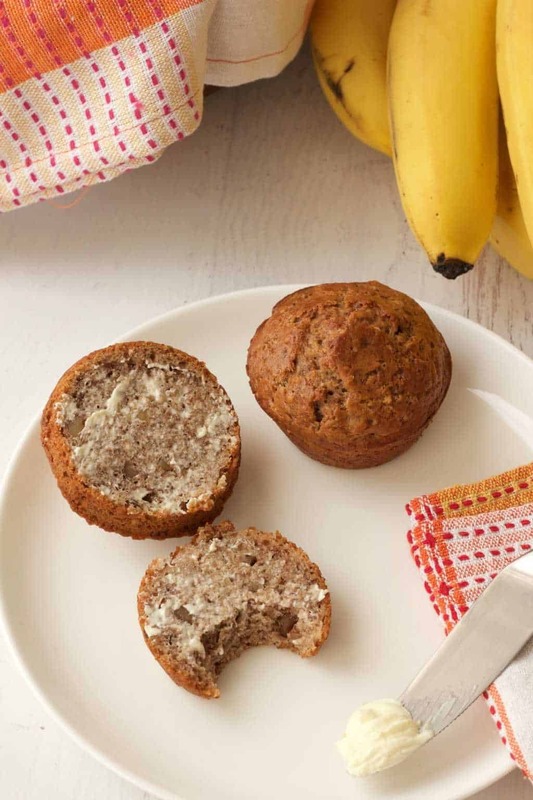 You can try leaving it out and just using 3 Tbsp extra mashed banana or if you have chia seeds on hand you can make a chia egg the same way you make a flax egg. The best results would be from using a flax egg though because that’s how the recipe has been tested. I did not have the extra banana but they still turned out moist and delicious! Yes you are so right about the smell! My house smelled amazing! 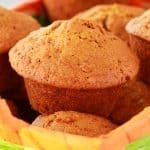 I am not a Vegan but my husband is for just a few months now and he loved the muffins. I will definitely make these again. Thanks for sharing your recipe! 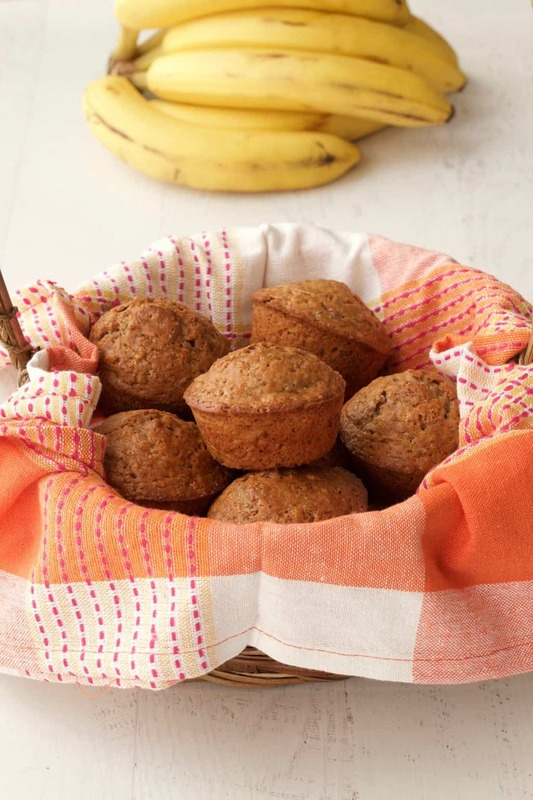 Making these for the second time again without flax but with an extra banana. I sprinkled a bit of brown sugar on top of about half of the muffins. Can’t wait until the oven timer goes off! Made these to use up some extra bananas. Subbed frozen blueberries for the walnuts (hubby allergic) at my 5-yr old’s suggestion. They both devoured them! Making again next week for school breakfast. Thanks! 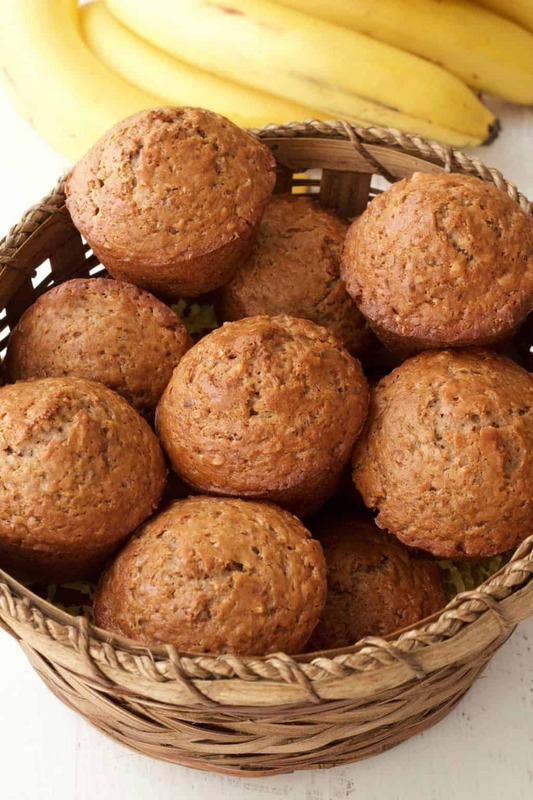 I made the banana muffins and they were great. The only thing I changed is I put 1 teaspoon of vanilla and 1/8 teaspoon of mace, and only put half the sugar. I got extra 12 muffins. I was so excited to make these and I followed all of the instructions to the letter. After leaving them out for 10 min the outside of the muffins were hard as rocks. :'(…the inside were perfect. Delicious! 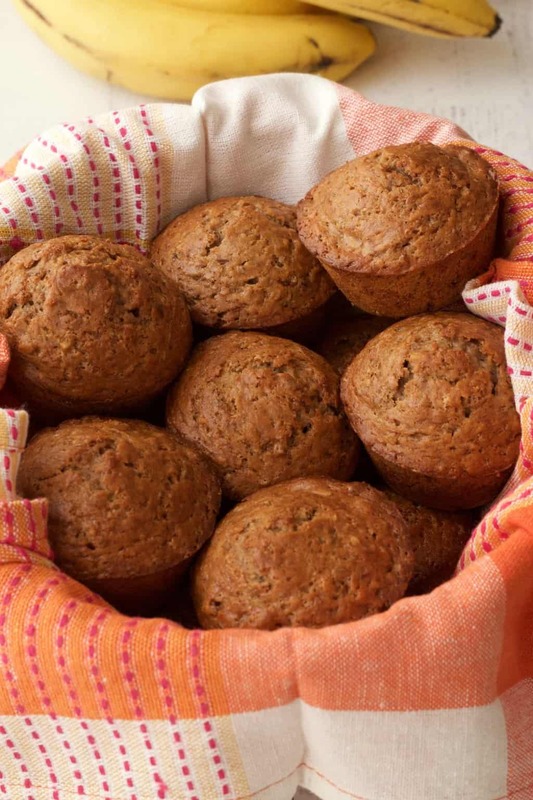 These muffins were moist and fluffy, not too sweet and hearty enough for a good breakfast. 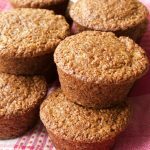 These will be going in my breakfast meal prep rotation! **I substituted canola/vegetable oil for coconut oil.